1. Involve citizens in the process in a meaningful way. 2. Activities should have a genuine science outcomes. 3. All involved should benefit. 4. Citizen scientists may participate in multiple stages of the scientific process. 5. Providing feedback to participants. 6. Citizen science should be considered as a research approach and understanding. the limitations, biases and not over estimating what is possible. 7. Data and metadata should be made available and results should be open access. 8. acknowledging participants in results. 9. need for evaluation for scientific output, data quality, participant experience and wider social and policy impacts. 10. Need to pay attention to legal and ethical issues of copyright, IP, data sharing, confidentiality, attribution, and environmental impacts. The ten principles are open to development over time and the aim of having that is to help with the challenges in the field – such as duplication of efforts, mixed messages, and there are opportunities for collaborations and partnerships. They can help new joiners to start with best practices. There are other tools to improve the work of practitioners – including the 2012 guide on understanding citizen science & environmental monitoring which covered 150 projects. The report identified that one size doesn’t fit all and they identified that projects need to learn from others. 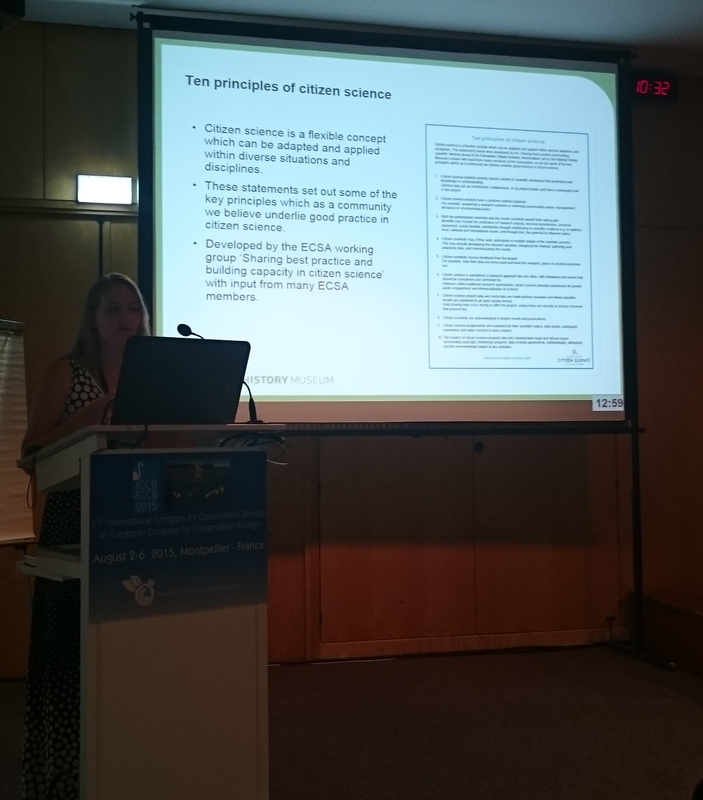 There are guides for BioBlitzes and how to conduct them, and there are guides for choosing citizen science, evaluation tools from CLO (See Tina Philipps talk from yesterday). 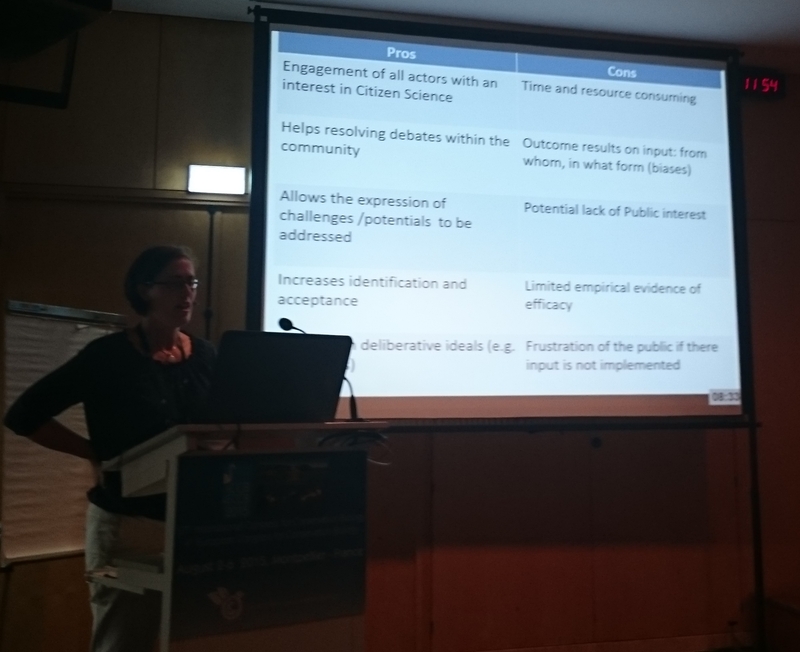 Potential of digital technologies to enhance openness in learning and science – Marisa Ponti – many citizen science project still happen off line, and there are many digital technologies that can be used to share and use the data. However, it is worth thinking about the potential of educational resources that can be used in such programmes. Open education and resources – learning, teaching and research that is in the public domain under open licence for reuse and modification has a role to play. Openness and access are important to citizen scientists – it can be increased and improve in the outputs of citizen science projects. Outputs are not the final publications, but also the data, protocols, logs and systems. 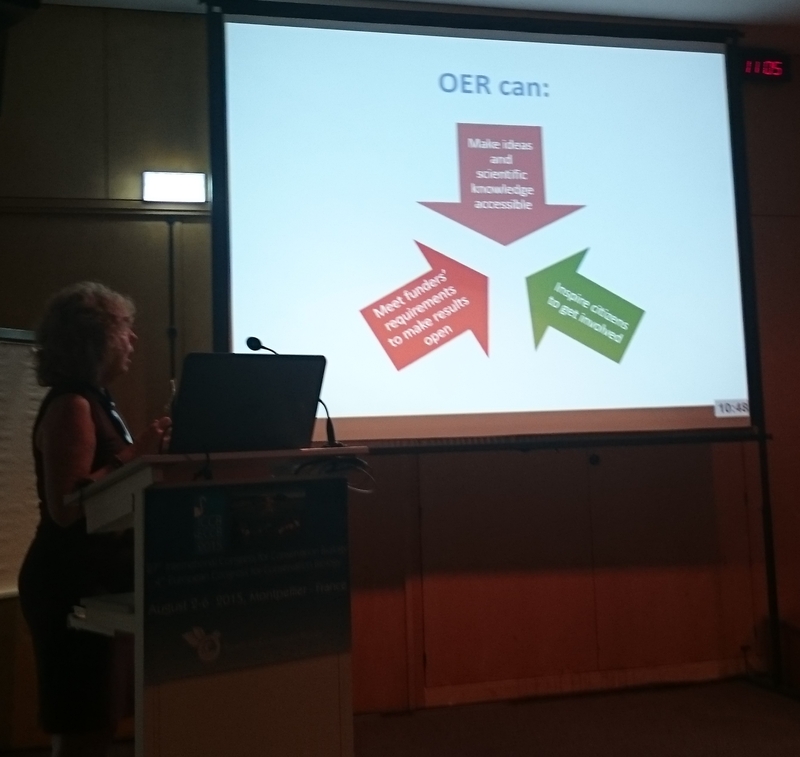 Open Education Resources (OER) can help in make ideas and scientific knowledge accessible, inspire people to be involved so they are not just passive participants, and can also help to meet funders’ requirements to make the research open. 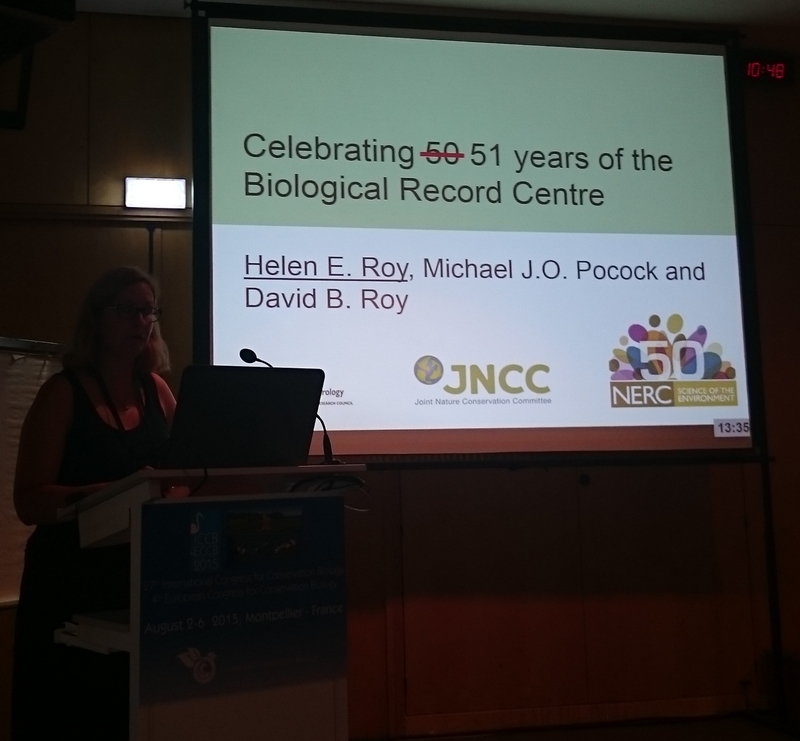 OER can help in reimagining what science is – can build a community outside institutional settings – such as Cornel Lab of Ornithology. It can also support self-driven and peer-based learning approaches, allowing people to run their own investigation, and OER can support experimentation with open practices. There is a specific website in the OER area of citizen science for learning and research. Resources help in creating suitable teaching sessions. There are other training material that can be reused and changed. There are, however, warning – the conditions for broad participation – OER in themselves with digital technology are not a solution unless we create the conditions for engagement of many people. There is a need to create the condition to allow participants to own the project. OER need to be in dialogue in terms of how people use them. Citizen science, social learning and transforming expertise – Taru Peltola – She discuss the learning in citizen science with a paper that is currently under review (part of the ALTER-Net). In citizen science there is plenty of rhetorics – transparency, local knowledge, democracy … but social learning is usually seen with broader benefits that are related to citizen science and didn’t receive enough attention. There is a need to critically analyse the learning within citizen science, and learning is an important mechanism that require mutual learning (by participants, organisers and scientists), and learning can occur in all types of citizen science initiatives. Looking at literature on learning, there are questions on the outcomes (facts, instruments), process (individual/social/institutional), and who is involved (scientists/volunteers). It is wrong to assume that only the volunteers learn in citizen science – there are also important learning that the scientists get from the process. 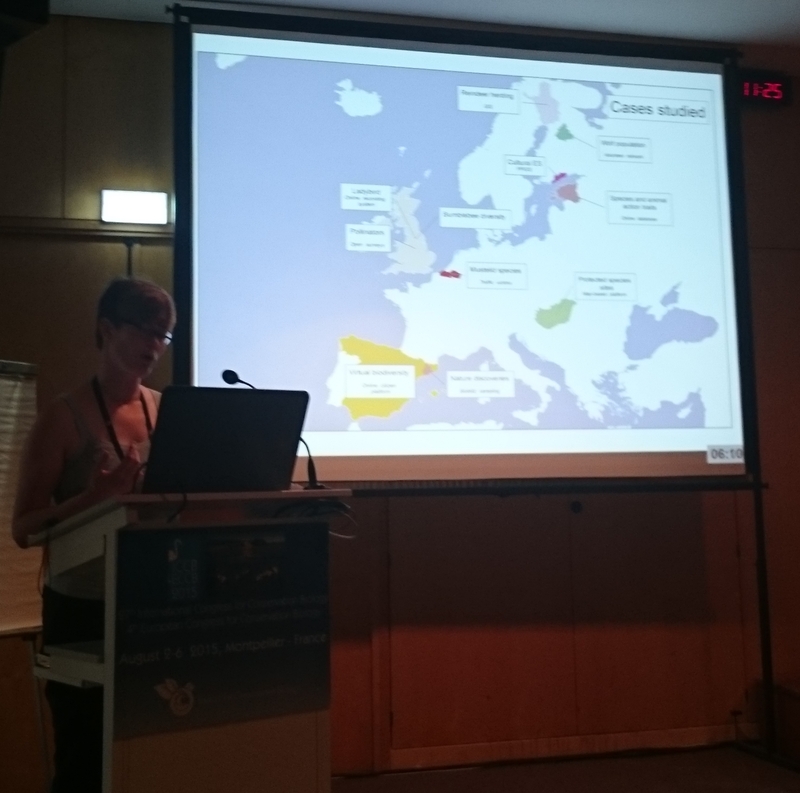 To gain more understanding, they looked at 14 cases across Europe – mostly monitoring species, but also cultural ecosystem services through participatory GIS or reindeer herding. The results from the cases are that the learning processes and outcomes are both intended and unintended, the learning is situated, the learning are unevenly distributed – need to pay attention who is getting the attention and how people are included, and the learning outcomes are continuous. They also found out that factual and instrumental learning outcomes are easier to assess, but it is important to pay special attention to the social and institutional process. These need to included in the design and implementation of citizen science projects. Extreme citizen science: the socio-political potential of citizen science – Muki Haklay – in my talk, I have situated citizen science within the wider changes in access and use of environmental information. I have used the framework of 3 eras of environmental information (covered in details in the talk in the Wilson Center). The first two eras (between 1969-1992 and 1992-2005) are characterised by experts who produce environmental information and use it to advise decision makers. In the second era, information is shared with the public, but in unidirectional way – experts produce and release information to the public in a form that is suitable to share with other experts – so it is challenging to comprehend it. While the role of civic society and NGOs was recognised in the second era (e.g. Rio’s Principle 10), in terms of citizen science, the main model that was acceptable was the contributory model in which volunteers focus on data collection, so the information is verified by experts. With the third era (since 2005), we are seeing that the public is also accepted as producer of environmental information. This transition is opening up many opportunities for citizen science activities within environmental decision making. However, looking at the state of the art of citizen science, there is plenty of scope of involving people much more in the process of setting up citizen science projects, as well as engaging people with lower levels of education. I used 3 classifications of participation in citizen science (slides 14-16) to demonstrate that there is a range of ways to participate, and that different issues and different people can participate at a level that suit them and their life. After introducing the vision of ‘Extreme Citizen Science’, I demonstrated that it is a combination of participatory process and use of technology. I introduced the participatory process of Mapping for Change, which deliberately starts with less use of technology so people can discover the issues that they would like to explore, and then decide how system such as Community Maps can be used to address their issues. I introduced GeoKey, which provides the infrastructure for participatory mapping system (such as Community Maps), and then demonstrated how Sapelli (data collection tool for low literacy participants) can be used in a careful participatory process with indigenous groups to design suitable citizen science projects. I used examples from the Congo basin and the work of Gill Conquest, the Amazon in Brazil-Peru border work of Carolina Comandulli and the current crowdfunding effort in Namibia for the Ju|’hoansi people by Megan Laws. I ended with a note that intermediaries (such as conservation organisations) have an important role to play in facilitating citizen science and helping in maintaining and sharing the data. The slides from the talk are provided below. The final talk was citizen science strategy 2020 for Germany by Anett Richter – the ‘citizens create knowledge – knowledge create citizens’ project is a German Citizen Science capacity building project: it includes building citizen science platform, scientific evaluation of citizen science, developing resources for teaching and developing projects and a citizen science strategy 2020 for Germany. The need for strategy is that it helps focus on a problem and thinking about how to solve it. There are many projects already happening in Germany, with museums and NGOs, as well as conservation organisations. Lots of technologies are enabling it. However, we don’t have common understanding of where we want to go? Need framework for data use, there are risks of inconsistent communication to stakeholders. The way to open the strategy is involve wide range of stakeholders in the development – public, politicians, funders, community. The wider engagement in development strategy, require time and resources and there might be lack of public interest. They run 5 dialogue forums on different issues with 400 people involved. They explore capacities in science – think of science culture for citizen science – rewards for scientists to do so. Strong data infrastructure – data quality, validation, database management and other issues. Their vision – in 2020 citizen science is integral part of German society and open in all areas of science and for all people. Also want to have reliable web-based infrastructure. They will carry out consultation online in the autumn and publishing the strategy next year.